Caitlin Fields and Ernie Utah Stevens perform their long program at the 2015 U.S. National Figure Skating Championships. In their first season together, U.S. pairs team Caitlin Fields and Ernie Utah Stevens not only won the junior title at the 2015 Prudential U.S. Figure Skating Championships, but placed fifth at the 2015 World Junior Figure Skating championships. The skaters, who teamed up in August 2014 and are coached by Serguei Zaitsev, had such a late start that they weren’t even sure they would be able to compete last season. The newly-paired team had only two opportunities to compete prior to nationals. They competed in and finished first at both the Midwestern Sectionals and the Mentor Nestle Nesquik Torun Cup. “Unfortunately, I had an emergency appendectomy in mid-December and we were grateful that I was able to recover enough to compete in Poland as well as nationals,” added the 19-year-old. When Fields and Stevens arrived in Greensboro, N.C., their practices went well and their schedule was clear and smooth. The team fought hard and placed first in both the short and long program to win the junior national title. “When we stepped on that ice, we were not going to let anyone take it away from us,” said Stevens. Going into Junior Worlds, the new team didn’t have much exposure to the skating community, so there weren’t many expectations. “That made it enjoyable to tell everyone our story through our skating,” said Fields. In Tallinn, Estonia, the team wasn’t flawless, but they placed a respectable fifth. Both skaters felt it was a success as they received all the levels they were going for. 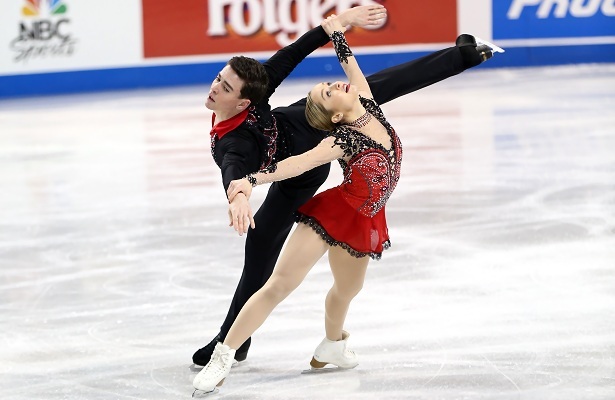 This season, the skaters are keeping last year’s long program to Don Quixote, while their new short program is to “Piano et voix rythmiques” by Hugues Le Bars and was choreographed by Shanetta Folle and Zaitsev. In addition to working on their split twist and presentation skills, the skaters are also working on triples jumps. “We can thank our choreographer, Shanetta, for pushing us completely and tirelessly to develop a new level of footwork as well,” he added. When not training, Fields studies nutrition, while Stevens is a junior at Butler University where he is majoring in Strategic Communications major with a specialization in Advertising. In their spare time, Fields enjoys outdoor activities such as hiking and rock climbing, while Stevens likes to watch figure skating, horse racing events, and learn new languages. The team’s first competition this summer was at 2015 Skate Milwaukee in July where they past their senior test. Afterwards, they traveled to Moscow, Russia, for extensive training with their coach to work with Artur Dmitriev and his teams. They are currently pending ISU Challenger series events later this fall and are also listed as alternates for Skate America. Their goals for this season in their senior debut is to develop their elements and continue to gel as a pair team.